You know I am a huge fan of Project Run and Play. I have participated for years from sewing along to competing to judging. The concept of Project Run and Play has grown so much under the direction of Audrey from Skirt Fixation. Project Run and Play recently released a pattern collection, Project Farmer's Market, combining patterns from multiple designers with a central theme. Each of the 10 patterns in the collection is beautifully designed. I quickly grabbed the Petit A Petit Upbeet Tee, the Sew Chibi Ichigo Bomber Jacket, and the Petit A Petit Turnip Up Trousers. 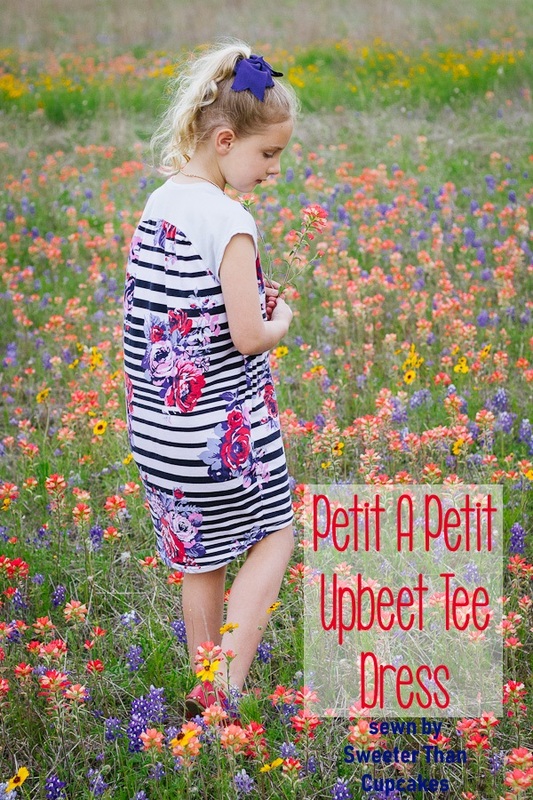 This Upbeet Tee Dress might be my favorite! The Texas wildflowers are really showing off this year. The first spotting of a Bluebonnet always makes me giddy. Even though I had a sudden onset of Spring allergies this year, I cannot help but delight in God's amazing display of creativity. At first the raglan style sleeve pattern piece had me scratching my head about how it would all come together. Not only are the instructions very clear, but it also sews up quickly and easily. The front gathers are the perfect feminine touch. The Upbeet Tee pattern also features a tshirt length that omits the gathers making it unisex! The relaxed style makes wearing the dress like wearing secret pajamas. The cocoon shaping of the Upbeet Tee Dress adds the perfect amount of style. I sewed up the size 7 and added 3.5" in length for Tandy. You wouldn't want to add too much length or the narrow shaping at the knees might restrict movement. Also a good reason to make sure your stitch in nice and stretchy at that hem! Look at the high/low hem detail!! It is hard to see at the top back in this photo, but the sleeve piece comes together with a center back seam. Be sure to check out the rest of the Project Run and Play Farmer's Market Collection. I wasn't asked to sew or promote this pattern. I'm just a huge fan!